2018 is the Year of the Dog, and Chinese New Years is on February 16th, 2018. The dog is the eleventh position of the Chinese zodiac, and those born in the years 1934, 1946, 1958, 1970, 1982, 1994, 2006, and 2018 have the Chinese zodiac animal of a dog. 2018 is an Earth Dog Year, and the Chinese horoscope predicts a year full of good fortune mingled with exhaustion. Those born in the Year of the Dog are efficient thinkers that spread good justice and advice. They can be friendly, composed, and clever, and display loyalty and respect for others. The Year of the Dog can accelerate new beginnings, but may bring about frustration and exhaustion. For those born in the Year of the Dog, 2018 will increase financial good fortune, but all zodiac signs should pay extra attention to their health. 2018 is a great year to start eating healthier, exercising more, and relinquishing bad habits. This gorgeous 18” Golden Dog Statue Holding a Wealthy Pot is embellished with fine golden color, decorated with exquisite detailing, and designed with excellent craftsmanship. The golden accents on the statue will enhance good fortune, and the beautiful wealth pot will ensure a 2018 full of financial prosperity and business luck! The gold ingots and coins around the statue demonstrate an abundance of new opportunities, positive financial excellence, and increase in social status. This golden dog statue is perfect for bringing in good fortune for 2018, and is the perfect statue for bringing peace, abundance, wellbeing in your home, workplace, and family. The golden dog and wealth pot sit upon a stool with Chinese inscriptions of good luck and abundant fortune. 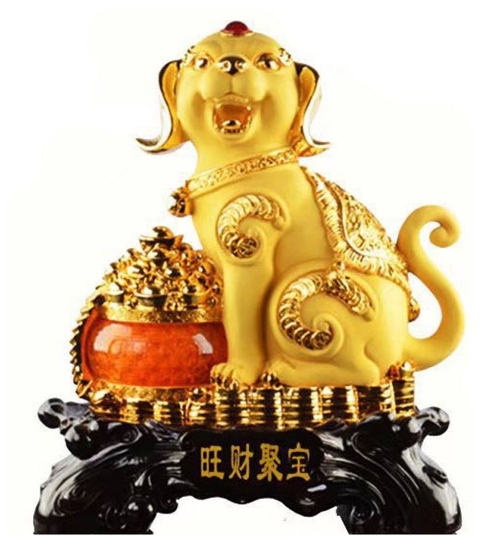 This big dog figurine is especially good for people born in the Year of the dog, and those in harmony to the zodiac Dog, such as zodiac Tiger and zodiac Horse. The dimension of this big dog statue is approx. 15" x 8" x 18". It is made of resin.